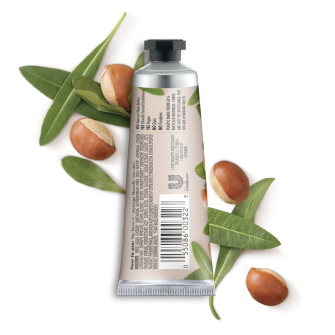 This luxuriously creamy hand cream not only smells amazing infused with sandalwood and natural shea butter, but it provides ultimate moisture for dry hands. Your skin will thank you! This hand cream is also cruelty-free, paraben-free, dye-free. This luxuriously creamy Hand Cream, infused with Sandalwood and natural Shea Butter, not only smells amazing, it provides ultimate moisture for dry hands, too. Your skin will thank you! All our hand creams are free from any parabens or dyes and are certified Vegan & Cruelty-Free. We’ve infused this Hand Cream with Shea Butter, a traditional ingredient known to protect skin from dryness and against harsh climates, by sealing in moisture for lush, smooth skin. We source our Shea Nuts from Ghana and Burkina Faso, where farming is key to the community. This Shea Butter is made according to long-standing traditions; first melted under wood fire, then cooled overnight. And while you are at it, indulge yourself in fragrances infused with ethically sourced Australian Sandalwood. Our Hand Cream exudes a harmonious scent with creamy, exotic and woody balsamic notes. • You know it - massage liberally into skin. 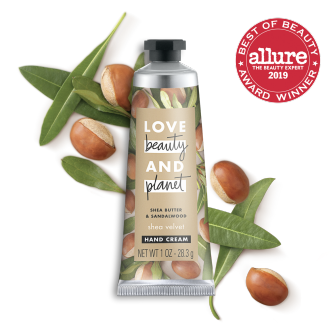 Love Beauty and Planet® Sandalwood and Shea Butter Hand Cream works to moisturize your hands. Parabens have got the world of beauty in a spin. Our products are all paraben-free, but discover what parabens are, the truth behind all the drama, and why we choose to turn our attention to finding the very best alternatives. shea butter & sandalwood hand cream is rated 4.7 out of 5 by 49. Rated 5 out of 5 by MsDeeDee1 from Amazing smoothness This will leave your skin super soft and smelling amazing! Rated 5 out of 5 by colorncut from Complemented! #LoveBeautyandPlanet #Sponsored I have not worn scented lotions since giving birth. I just fell in love with Love Beauty and Planet Shea Butter & Sandalwood Hand Cream scent and needed to give it a try. My husband actually noticed and said "wow you really smell good today". I almost fell over because he is not one to really notice such things. This is now a forever handbag cream!